Dr. Gale A. Bishop, who celebrated a 50-year academic career in 2014, has impacted innumerable students and produced a body of published work consisting of 108 papers, 11 websites, and hundreds of talks on science, science education, and sea turtles. Born in North Dakota, Bishop grew up in Sioux Falls, South Dakota, where he attended high school before earning a B.S. (1965) and M.S. (1967) in geology from South Dakota School of Mines and Technology. He went on to earn a Ph.D. (1971) in Geology from University of Texas (Austin). 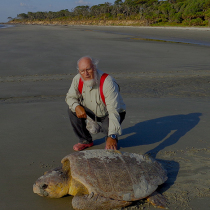 His career included 28 years teaching at Georgia Southern University (1971—1999), followed by five years at the South Dakota School of Mines and Technology (2001—2006), and 25 concurrent years as director or co-director of the St. Catherines Island Sea Turtle Conservation Program (1990—2012) now known as the Georgia Southern University Sea Turtle Program at St. Catherines island (as of 2014). Bishop was founding director of the GSU Museum and has served as associate editor for the Journal of Crustacean Biology and Associate Editor for Invertebrate Paleontology for the Proceedings of the Biological Society of Washington 2001—2008). Bishop’s earlier research focused on fossil decapod crustaceans (crabs, lobsters, and shrimp) of the Cretaceous of North America and his later research focused on heavy mineral sand accumulation and occurrences, sea turtle nesting ecology and conservation, and science education reform. 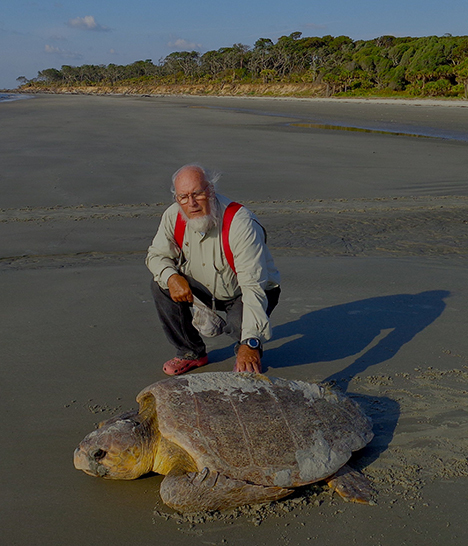 He has produced a significant body of research on nest morphology and nesting ecology of loggerhead sea turtles, and the geology of St. Catherines Island. He impacted the study of the geological record with the 1997 discovery of the first-known fossilized sea turtle nesting structures in the Cretaceous Fox Hills sandstone of Colorado. The GSUSTP@SCI practices active field monitoring for 140 days a year, field journaling, Facebook scientific journaling, and integration of emerging technologies into conservation. Neil H. Landman1, René H.B. Fraaije2, Susan M. Klofak1, Neal L. Larson3, Gale A. Bishop1, and Isabelle Kruta1. 2014. Inquilinism of a baculite by a dynomenid crab from the Upper Cretaceous of South Dakota, USA, American Museum of Natural History, Novitates (3818):1-16. Meyer, B. K., R. K. Vance, and G. A. Bishop. 2014. Rising Seas: Addressing eroding habitats on St. Catherines Island, Georgia (U.S.A.), Status of the World’s Sea Turtles, SWOT Report, (9):18-19. Pirkle, F. L., G. A. Bishop, W. A. Pirkle, and N. W. Stouffer. 2012. Heavy Mineral Deposits of the Fox Hills Formation Located Near Limon, Colorado, Technical Papers, Mining Engineering, Society for Mining, Metallurgy, and Exploration (U.S.), 64(3): 47-57. Bishop, G. A., H. B. Rollins, and D.H., Thomas, (eds), 2011. Geoarchaeology of St. Catherines Island, Ga., American Museum of Natural History Anthropological Papers, 94, 389 p.
Bishop, G. A., F. L. Pirkle, B. K. Meyer, and W. A. Pirkle. 2011. The foundation for sea turtle geoarchaeology and zooarchaeology: morphology of recent and ancient sea turtle nests, St. Catherines Island, Georgia, and Cretaceous Fox Hills Sandstone, Elbert County, Colorado., Chapter 13: 247-269, in Bishop, G. A., H. B. Rollins, and D.H., Thomas, (eds), Geoarchaeology of St. Catherines Island, Ga., American Museum of Natural History Anthropological Papers, 94. Bishop, G.A., and B.K. Meyer. 2011. Sea turtle habitat deterioration on St. Catherines Island: deﬁning the modern transgression; Chapter 14: 272-295, in Bishop, G. A., H. B. Rollins, and D.H., Thomas, (eds), Geoarchaeology of St. Catherines Island, Ga., American Museum of Natural History Anthropological Papers, 94. Bishop, G. A., Vance, R. K., Rich, F. J., Meyer, B. K., Davis, E. J., Hayes, R. H., and Marsh, N. A. 2009. Geology Field Education for Teachers at Georgia Southern University, Historical perspectives and modern approaches Chapter 19: 223-251, in Mogt, D. W., S. J. Whitmyer and E. J. Pyle (eds), Field Geology Education: Historical Perspecitives and Modern Approaches, Geological Society of America, Special Paper 461. Bishop, G. A., R. H. Hayes, B. K. Meyer, H. E. Rollins, F. J. Rich, D. H. Thomas, and R. K. Vance. 2007. Transgressive Barrier Island Features of St. Catherines Island, Georgia, p. 39-85, In F. J. Rich (ed), Fieldtrips of the 2007 Annual Meeting, Southeastern Section, Geological Society of America. Georgia Southern University (Statesboro, GA). Bishop, G. A. and A. B. Williams. 2005. Taphonomy and Preservation of Burrowing Thalassinidean Shrimps. Proceedings of the Biological Society of Washington 118(1): 218-236. Bishop, G. A., R. M. Feldmann, and F. Vega. 1998. The Dakoticancridae (Decapoda, Brachyura) from the Late Cretaceous of North America and Mexico. Contributions to Zoology; 67(4): 237-255. Hulbert, R. C., Jr., R. M. Petkewich, G. A. Bishop, D. Burkey and D. P. Alshire. * 1998. A Middle Eocene protocetid whale (Mammalia: Cetacea: Archaeoceti) and associated biota from Georgia. Journal of Paleontology 72(5): 907-927. Bishop, G.A. and E. C. Bishop. * 1992. Distribution of Ghost Shrimp, North Beach, St. Catherines Island, Georgia. American Museum of Natural History, Novitiates No 3042: 1-17. Bishop, G.A. * 1986. Occurrence, preservation and biogeography of the Cretaceous crabs of North America. In Crustacean Issues 4: Crustacean Biogeography, R.H. Gore and K.L. Heck (eds.) Rotterdam: Balkema Press, pp. 111-142. Bishop, G.A., and A. B. Williams*. 1986a. The fossil lobster Linuparus canadensis, Carlile Shale (Cretaceous, Turonian), Black Hills. National Geographic Research 2(3): 372-387. Bishop, G.A. * 1987. Positive taphonomic feedback in North American Tethyan Cretaceous decapod-worm associations. In Shallow Tethys 2, K. McKenzie(ed.). Rotterdam: Balkema Press, p. 319-329,+ 5 pls.